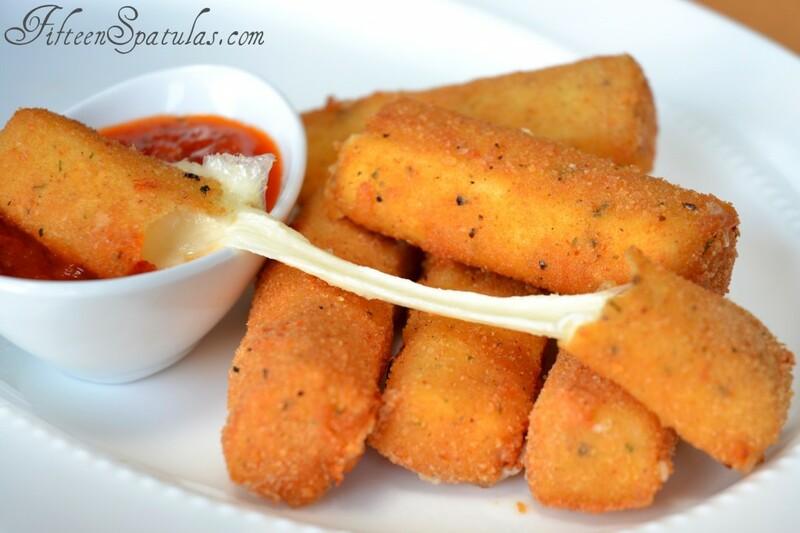 Homemade Mozzarella Sticks are simple to make, and a wonderfully ooey gooey snack! Freezing them before frying is the secret for this recipe. 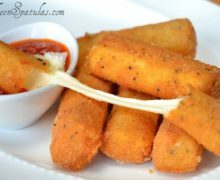 I’ve always loved the ooey gooey stretchiness of a mozzarella stick, and admit that the frozen boxes of pre-made mozzarella sticks were quite present in my childhood. Turns out, they are really easy to make yourself, and taste even better when they’re freshly made. There are a few things to consider when making these. First, they should be breaded twice so they have a thick enough shell to keep the cheese inside. The other thing is to freeze them for at least two hours before frying, otherwise the cheese will likely ooze out of the shell, and that’s no fun. The upside to this is you can make these a day ahead of time and keep them in the freezer, and fry them whenever you’re ready to serve. Heck, you could just keep ready-to-fry mozzarella sticks in your freezer for whenever you feel like making them. Serve them up with some marinara for dunking, and you’re ready to go. 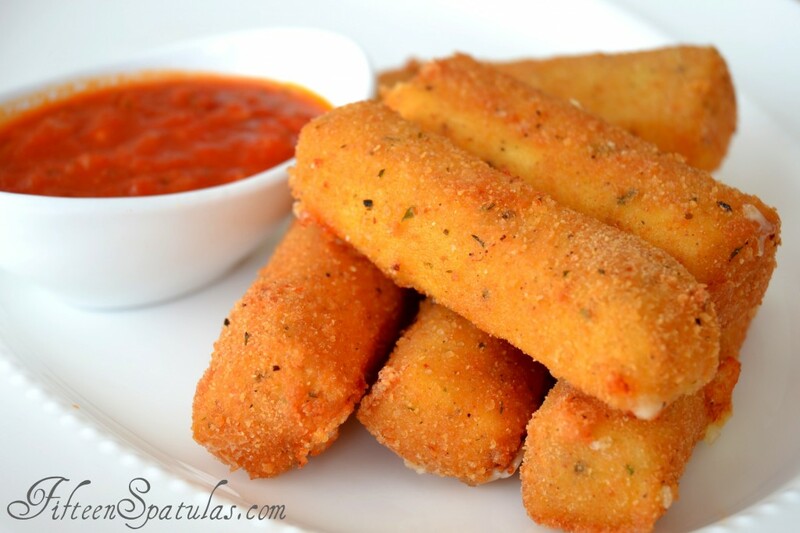 To get started, cut a whole milk mozzarella block into sticks, and dip each stick into egg, then in bread crumbs. Repeat this process twice, so you get a thick enough coating on the outside. Freeze the mozzarella sticks for two hours, then deep fry for about 30-60 seconds, until golden brown. It really doesn’t take long, as the coating is so thin, and you don’t want to overcook the cheese in the middle. Fried Calamari, Potato Croquettes, and Coconut Shrimp are some of my other favorite fryer snacks. Enjoy! Cut the block of cheese into 1/2 inch sticks. I had about 12. Place the eggs in a bowl with 1/8 tsp each salt and black pepper, and whisk to combine. Then place the bread crumbs in a second bowl, and season with 1/8 tsp each salt and pepper. Take each cheese stick and dip it into the egg, letting the excess drip off. Then coat in the breadcrumbs, shake off the excess, and place on a plate. Repeat with the remaining cheese sticks. 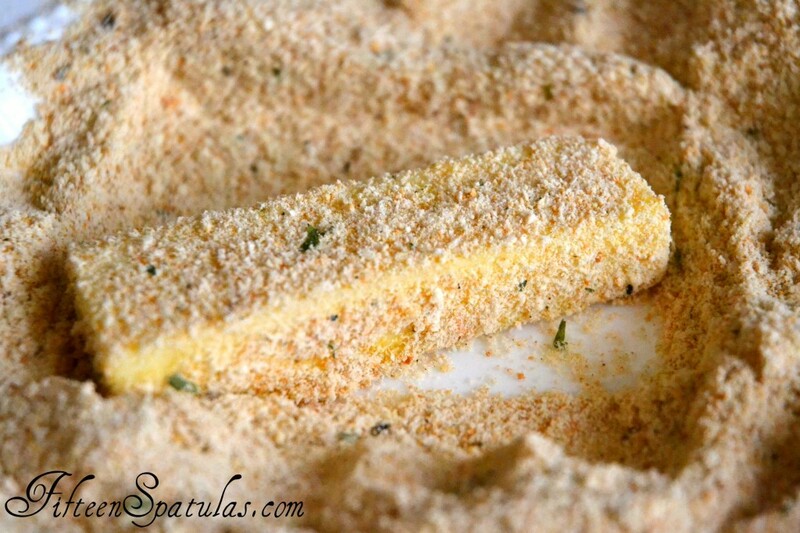 Once each cheese stick has been breaded, take each one through the egg and breadcrumbs again for a second coating. Place the mozzarella sticks in an airtight container and freeze for two hours. Heat up a fryer to 365 degrees F, and fry for about 30-60 seconds until golden brown. Serve with marinara or your favorite dunking sauce. Enjoy! to buy frozen shrooms this way in WI. Hi Sally, do you mean just coating and frying the mushrooms? I was wondering if the coating mixture would STICK to the mushrooms.This recipe would be good also on cheese curds. So glad to hear that Sam! I love peanut oil for frying too. More expensive, but worth it.